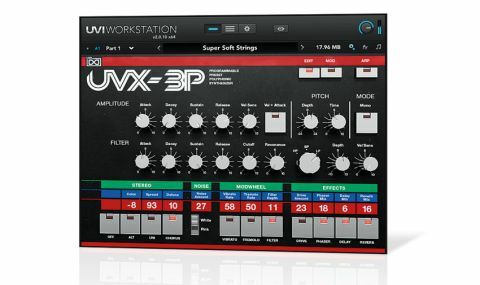 With UVX-3P, UVI have captured the spirit of yet another classic, but although it sounds ace, if your analogue synth folder is already well-stocked, it may be somewhat redundant. Captures the spirit of the original. Sound great. Running in the UVI Workstation ROMpler engine or MOTU MachFive, UVX-3P is a 6GB multisampled JX-3P - a low-end (but very capable) 80s Roland analogue synth. "You can't help but be impressed by the richness of the samples"
Take a tour of the 150+ presets and you can't help but be impressed by the richness of the samples and the fatness and warmth of the synth itself. Control-wise, UVX-3P holds no surprises, much like the pared-back original: a multimode filter (HP/LP/BP), amp and filter envelopes, various Stereo options and a few simple effects. Beyond the envelopes, there's a hardwired LFO (Pitch, Drive, Volume and Filter) and step sequencer (Volume, Filter), while the mod wheel can be simultaneously assigned to Vibrato, Tremolo and Filter cutoff. There's also an arpeggiator, but it's uneditable - thankfully, UVI Workstation has a much better one built in.